This elegant building is somewhat overshadowed by its three more famous neighbours, Blythburgh, Westhall and Wenhaston. But I have a soft spot for it; partly because it was one of the first Suffolk churches I ever properly explored, on an ambitious walk about ten years ago. But mainly, because it is rather lovely. The church sits at a sharp bend in the Halesworth to Blythburgh road, a familiar landmark. There's a decent pub across the road, the Queen's Head. The sign shows St Etheldreda; her father, King Anna, was killed in the Battle of Blythburgh near here, and the church there had shrines to both Anna and Etheldreda until the Reformation. You walk up to the church from the corner of the Wenhaston road, and just inside the gate here is a gravestone to Samuel Croft, who died at the age of 21 in 1849. His headstone depicts a team of two draught horses leading a plough, a remarkable survival. There are several other interesting gravestones and inscriptions. The grand south porch could only be in Suffolk, and its 15th century flushwork confectionery guards an austere Norman doorway. There's another one around on the north side. It is the south doorway you step through, and like all churches around here All Saints is open to visitors every day. When I first came here, some twenty years ago, I'd found the interior rather shabby, but on more recent visits it has been beautifully kept, clean, bright and white. On this occasion I stepped inside to find two rather disappointed ladies. "Do you know what has happened to the wall painting?" one of them asked. It took me a moment to work out what she meant - they thought they had found Wenhaston church, which lies about half a mile to the south, and where there is a fabulous doom painting, actually on a tympanum rather than the wall. I pointed them in the right direction, and settled down to enjoy the silence. To be sure, this is not one of the county's most exciting churches, but it is a pleasing spot to stay and sit a while. There is a banner stave locker in the south west corner of the nave. In this part of Suffolk they are common enough, but this is the only one I know that has been returned to its original usage. Several of the others are used for storing hymn books and cleaning equipment; the one at nearby Wenhaston has an ugly modern door. They all probably had doors originally. There's a curiosity propped up behind the pulpit. It is the original World War One Flanders cross for Walter Evan Day, sent back to his family when the Empire War Graves Commission replaced it with a permanent memorial. However, Walter Day is not mentioned on the Blyford parish war memorial, or even on the Roll of Honour of those who fought, and appears to have no connection with Blyford. He was a Captain in the Royal Engineers, and was the son of Richard Evan and Edith Emma Day, of Plaistow Lane, Bromley, Kent. He was aged 31 when he died. He is buried at the Tancrez Farm Cemetery in Belgium. The font is a good, plain 13th century octagon, and there is a sedilia set up in the sanctuary, with its piscina in a corner above it. In the porch, books and plants were on sale, as they were when I visited all those years ago, and all in all there was a pleasing sense of continuity. On an earlier version of this entry I expressed my disappointment that the visitors book has been replaced, as I was looking forward to finding evidence of my previous visits (I had recently found my name in a visitors book in a Cambridge church, written as a child a quarter of a century before). 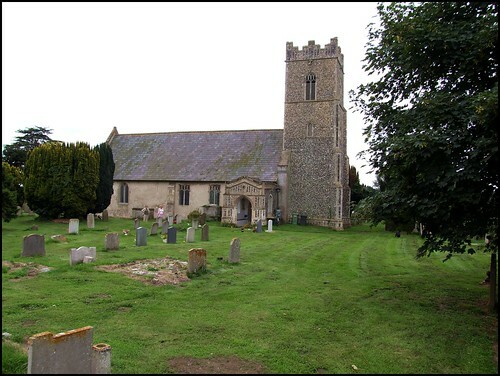 But Blyford, being open, and welcoming, and a pleasure to visit, fills its visitors books far more quickly than churches where visitors are the exception rather than the rule. And if it seems a quiet, ordinary place compared with its neighbours, then all the more reason for those visiting them to stop by here as well, and have a bit of a wallow in its simplicity.